There is also an alternate history of del Campo’s youth which claims that he first went to Spain rather than Rome to pursue his artistic education after having received some basic private art instruction in Lima. 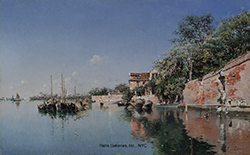 [ii] The assumption that he began his art education in Lima is further supported by the fact that his earliest known paintings are of South American landscapes. Regardless of whether he went first to Rome or Madrid, del Campo enrolled in the Real Academia de Bellas Artes de San Fernando (Royal Academy of Fine Arts of San Fernando) in Madrid some time around 1865. There he found an institution experiencing profound changes in its organizational structure and mission. Although the Academy was founded in the 1744, and modeled on the classical art schools of Florence, Paris and Rome, the political changes following the defeat of Napoleonic forces in 1814 led to several decades of insurrections and uprisings among the various royalist and democratic factions--including those associated with the Academy. Despite the tumultuous environment, del Campo seems to have studied in Madrid for a few years, and perhaps more significantly, it was there that he established a friendship with Lorenzo Valles (1830-1910) who was an important influence on his artistic development. In later years, both men continued to display their works at the annual exhibitions of the Academy in Madrid even though both of them worked primarily outside of Spain. Following his stay in Madrid, del Campo moved directly to Italy where there were a considerable number of Spanish (and Spanish-speaking) artists who formed a welcoming community for their colleagues. During this time, del Campo traveled extensively, painting in Naples, Capri, Rome, Assisi and Venice; he also visited France where he familiarized himself with the latest artistic developments in Paris in the late 1870s. As early as 1880, he began exhibiting works at the annual Salon des Artistes Français. 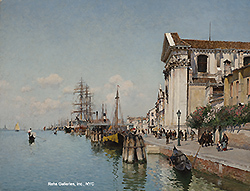 It was in Venice, however, that del Campo settled in the 1880s, again finding a congenial group of ex-patriot Spanish artists, including Martin Rico y Ortega (1833-1908) who became a close friend. The two men seem to have worked side by side in some cases, both of them painting the Venetian scenes that were popular with the increasing number of travelers arriving in the Adriatic city. 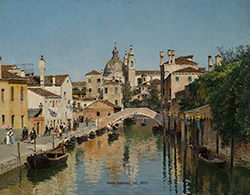 In fact, del Campo and Rico seem to have collaboratively developed a nineteenth-century iteration of the lucid and elegant approach to cityscape painting originally created by the eighteenth-century Venetian vedute painters such as Francesco Guardi and Canaletto. 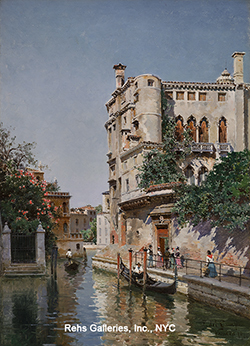 [iii] Other artists who were actively involved in this community included Joaquín Sorolla, Rubens Santoro, Mariano Fortuny and Antonietta Brandeis, all of whom found a consistent market for their paintings among international travelers who wanted a souvenir of their stay in Venice. Del Campo was particularly successful in developing a market for his work among English tourists, and in 1893, he moved to London where he continued to find supportive patrons among both the wealthy merchants of the industrial revolution and the British aristocracy. According to a report on an exhibition sponsored by Arthur Tooth and Sons in Chicago, del Campo’s paintings were “to be found in the collections of the Queen, the Princess of Wales and the Duchess of Edinburg.” [iv] Very likely, this London-based gallery was del Campo’s primary art dealer during the latter part of his career. The fact that the Arthur Tooth gallery put together a special exhibition to display in Chicago in 1893 further underlines the importance that they attached to del Campo’s work. According to a Chicago Daily Tribune report, they opened a gallery at Michigan Avenue and Thirteenth Street with a collection of 40 paintings by del Campo, no doubt to attract the attention of the 27 million visitors who were in Chicago that year for the Worlds Columbian Exposition. With this kind of support from an art dealer, it seems probable that del Campo’s career in London enabled him to enjoy a comfortable life. There is little information on the last two decades of the artist’s life, although it is likely that he died in London in 1923. [i] Chicago Daily Tribune “The Fine Arts” [Chicago, Ill] 24 Sep 1893: 29. [ii] It is possible that del Campo may have studied at Leonardo Barbieri’s Academy in Lima, but this is not yet clearly documented. [iii] For a further discussion of del Campo and Rico’s collaboration, see Impressions of Europe: Nineteenth-Century Vistas by Martin Rico, edited by Javier Barón, ex. cat. Meadows Museum, Southern Methodist University (Dallas and Madrid: Meadows Museum, Southern Methodist University and Museo Nacional del Prado, 2013) 113-114. [iv] Chicago Daily Tribune “The Fine Arts” [Chicago, Ill] 24 Sep 1893: 29.